I'm trying to copy the code and click on the picture and nothing happens! Click + if that was the first thing you did try to copy code and click on link …. if you did this…this makes you in your own right a premium ozbargainer. Says can't buy the coins, pay pal must be down. I'm trying to join but no dice. I really want that Built-in MS Paint integration. Damn, the PalPay server is down. I'll OzBarter for some EneCoins. Will there be a free premium service for those that are not Liberal/Labour voters? It seems this is just another example of a neocon corporatization favouring those with a decent stash of eneloops or a $80k high yielding car. It is obvious discrimination to offer a premium service and expect people to pay for it. Much like selling out of leftover banana prawns at the end of day. Asking for (Name redacted Digi1). Can you offer a 7 day trial? PalPay has 7 day refund policy, you're fine mate. Not as good as last year's Ozbargain turns asian but still pretty funny none the less..
We are trying to do a more politically correct version this year… until someone started talking about voting for Liberal or Labor in the comments. This is just what we asked for, we can let the market decide. Don't have enough money to pay for it? This IS genius. Thank you mods and devs for all the hard work that's obviously gone into this. Is it only available to telstra retail staff? OZBargain premium membership???? Shudd up and take my money already!!! I never even get through my 5 daily neg votes limit😂 Although I would LOVE the dial-a-mod service but only if it is manned by my favourite mod.I bet his voice is as soothing as his writing style. Would they only offer account-related advice? I need life advice more than account related ones. I need life advice more than account related ones. You need the Premium membership level on Date A Cheapo. The one from 4 years ago? As I had explained (in that old thread), it was created as a response to users' requests. You might be one of them but can't seriously remember now. I like the Autobuy feature, automatically buys something that's < $1 once per week. Thanks to that I now have a box of usb to iphone cords which i can splice together to make a belt! I just got my first month of Premium! The PalPay Service is unstable so I tried a few hundreds times and luckily get through once. Oh I am so excited to have it in the end. So guys keep trying and you will get it with your efforts! Can we have a feature for premium users like myself where anything on Ozbargain less than $5 is automatically purchased through Enecoin and delivered to my door? Nothing better than an Ozbargain surprise! edit: holy moly, someone already thought of it above! I’d pay handsomely for extra negs!!! It's a bit too obvious for regular OZBers… Nice try though. 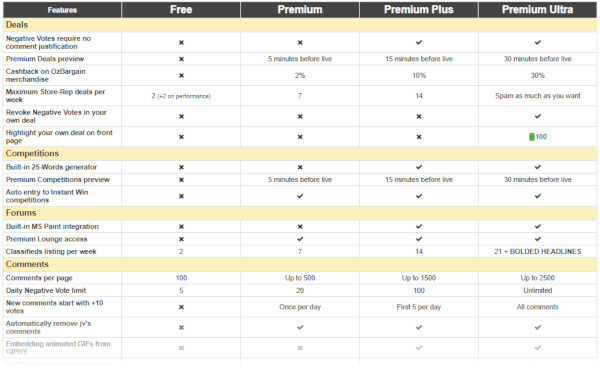 - Yeah it's not really worth it if you don't use the other premium features, but maybe it's just not for you then? - I wish it had Chromecast support too, but you can get a HighYield stick on sale for well under $100 now. Anyone having PalPay login issues please contact me. For a few EneCoins I can grant you exclusive access bypassing Scotty's silly rules. Trust me. Would I lie to you, friend? No student pricing? Ban bigpharmabargains. Just signed up, the benefits are amazing! For anyone on the fence about getting premium l, do it! You won’t look back. Nah, keep trying. It will work eventually. I've tried 4 hours non stop before I finally got through. Best 4 hours of my life!! I can't find it either. Any pointers? Nah, if they actually do this, it will get thousands of neg votes. Apparently if you type /haxxor_all after the code it provides unlimited auto-comments such as "First in with price jacking comment", "What deals are there, don't just post % off", "Not available on the West Coast", "Postage kills this deal", etc, etc. I have a forecast: many of the jokes will become reality within 5 years. There are people on this site that would pay through the nose to get unlimited negs. You are selling yourself short at these prices! What about bargain of 2000 Enecoins at 50% off RRP. Surprised no one has posted this deal. Where's the bargain? That's standard bulk buy price. my bad was looking at this guess we shouldn't believe what we see today hey. Are you able to gift this? I thought this was legit until 1800 OZB MODS appeared. It would’ve been even more legit if that number was actually purchased. April 1st. Seriously though, you and the moderating team should be compensated in some manner…perhaps keep the features of Premium membership for yourselves. Or swooping up all the referrer credits/bonus dollars and selling it at a discount in the Classified sections etc. Or bulk buy items/memberships and sell at a discount in the Classified sections. Print memorable one-liners on t-shirts and sell in the Classified section… you get the idea. LOL. Appy April Aaaaaa! How about a dedicated personal shopper included with Premium Ultra? :) It's getting hard to keep up with all those bargains without an aid! Scotty, I'll just need your bank account number and sort code. Then I can wire you the monies directly! Is there any cheap iPads? Can I get member # 104! Just got the Premium Ultra membership. Went through Ozbargain and neg'ed every idiot in sight, then ripped my photo ID off and took it back with the receipt for a refund of 1,000 🔋 EneCoins. The dumbfounded look on scotty's face was hilarious, I could tell I was his first for this. Had heaps of mods who were waiting in line behind me that gave me a funny look, was really embarrassed but I stayed strong by chanting Ozbargain a number of times to myself. I was like another paid subscription argh ! Then I looked at the date. Good to see Big Man Tyrone Scotty got a mention. Time to spam rep deals from my countless associations. So you are now going to create conditional access to deals and charge people for it. The large number of ads aren't enough to make money with? Hope an alternative comes out soon. Narnia would be the closest store. Check the wardrobe behind ya! For comments or for deals? You can't remove down votes from comments (yet), but for neg votes of your own deal posts, you'll need "Premium Ultra". See the plan matrix page. I'm all for providing Premium Ultra access to those who can afford it, and support the idea of comments starting with 10 upvotes for those select few. But I think there should be a discount for power users. I think that's how nepotism and corruption works - favour your own. I also think Premium Ultra members should be able to cast multiple negative votes, and ban users who annoy them. Yeah, everyone be quick before it's too late!!! I have never thought of spamming previously but I appreciate the opportunity to sign up for the Premium Plan. I never pay tax and the Taxation Office does not know that I exist. Or, I can put some Epson printed money in a brown envelope and ask my cousin that live close to the Kings Cross to leave the money outside the OB HQ 2am in the morning. Can I also suggest that you offer Premium subscribers a can of spam as a free gift. Easy way to keep up the cholesterol. I don't have PalPay but can I pay with 10 camels I have? This would be a very good idea. I need something like this to prevent me from purchasing useless items. My wife think I have became a hoarder since joining Ozbargain. I want a 30-day trial that I will cancel on the 29th day.